That Autumn Look | Out and About | A Continuous Lean. The series “That Autumn Look” probably generates more reader email than anything I have ever done on this site. The looks are a lot of fun to put together, but the process can be tedious. I’m not one to be excited for spring and summer dressing, so I’m happy to keep my still life looks to the autumn variety. The first installment for 2009 is inspired by my adventures (read: meetings and appointments) in and around the city. 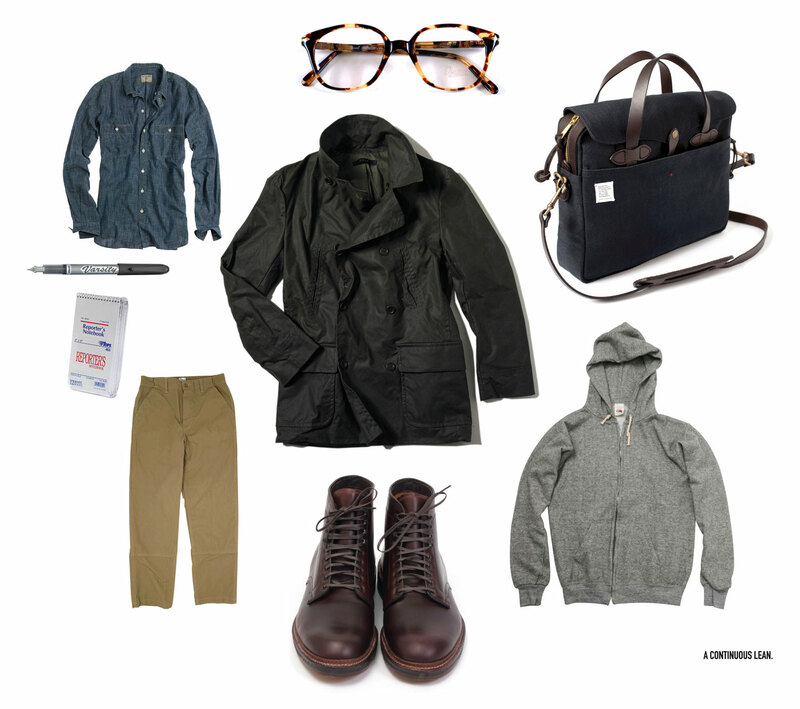 Here’s to crisp days with soft jersey zip-ups, chambray, leather boots and a good helping of waxed canvas. Those Varsity pens are like gold. I sold one for $5 to a guy in one of my classes last semester. They’re expensive for disposable pens, but they definitely don’t average out to $5 a piece. Great pics ACL. Love the J Crew Chambray for fall as well. I would sub that pen for a parker jotter though. ACL, A very inspired series, indeed. The first in this series from last fall remains my favorite combination, but this is running a very close second. I like those Post khakis. One can never have enough khaki. Loving the styles!! Autumn and Winter are my fave seasons but can you crack a good commuter cyclist look? I think you forgot to include one of your many amazing thermoses. Digging the boots and the blue Filson. Very sharp. The Unis waxed pea coat is killer!!! Damien â€” The Parker Jotter is my daily driver, but I like the Varsity as well. A Treasury of â€” Those thermoses work well with all fall looks, good call. Who’s selling Unis online? I can’t seem to find a source for that waxed peacoat. Will take suggestions for nice waxed coats that I can find as alternative to the Unis as well. Chris â€” call the Unis store on Elizabeth, they just got the peacoat in-stock. The J Crew chambray is amazing! One of the nicest shirts I own and worth the price. Unis is launching an webstore by the week’s end. It’s gonna be awesome. Good call on most of your stuff. Bit pricey, but you pay for what you get in most cases. But still, $75 for a Fruit of the Loom zip-up? C’mon, that’s nuts. I looked on the Japanese website for any vintage details (reverse weave, brass zipper…anything!) and came to the conclusion that yep, it’s a regular boy’s XL zip up. Sorry, but anyone who buys on that particular link has too much damn money and not enough sense. you buy your FotL in japan? jokes aside, it looks comfy! Regarding the J. Crew chambray….has the quality improved over the years? I presume and hope so. My two previous attempts at JC’s chambray were less than impressive. Fit was almost irregular and the material was heavy and cheap. Full disclosure: this was in the early 90s. They’re asking a pretty penny these days so I hope it’s not a reissue of a giant warehouse of shirts. Having said that, I may pick one up along with JC’s heather poplin tailor fit shirt. Now those are worth every penny for my needs. i build these things in powerpoint myself… makes it super easy. Why…would you use a disposal fountain pen, when refillable ones are so cheap? The coat from Unis looks really cool! Will have to check out their store. I own the J.Crew Chambray shirt… I get complemented every time I dawn it. A must own. pretty good introductory gear. very basic, but very autumnal. Great choices in the Zip up. Keep in mind, there are other brands putting out the same thing. You don’t have to buy these exact items by these exact labels. (if you were worried about that sort of thing). Nice. Where can you get the Post khaki’s? Can you get that hoodie in the US? Or is it another reason to visit Japan? Love this collection!! The J. Crew Chambray is my favorite shirt and I wear it at least 3 times a week. The quality is VERY good. As close as you can get to a real vintage workwear shirting piece that I’ve seen in a very long time. MW, thanks for the tip on the Varsity pens. Was going to order on Amazon, but thought it much more fitting to bicycle downtown to the stationary store that’s been there for decades. They said they’d had a strange number of requests for the pens today, so maybe you have a big fan base in Sonoma County. Any place where I can get the hoodie here in the US? Ahh yes, those Varsity pens are great, I use a Lamy now, but through architecture school those Varsity pens were the best. You could draw anything with them and it would just look good. I really like the Filson bag in black, though for 200 bucks less, i’d just as well go with the khaki or otter green version from Filson. They actually just recently added a brown version, which looks pretty nice. The Filson looks great, but what’s the point? It’s a limited edition of 200 which is sold out. I wish I could still get the old Champion sweat shirts and hoodies from back in the day. I’m suprised they haven’t hopped on the collaboration band wagon. Champion in Japan is some of the best stuff ever. I wish the company still actually cared about their home market. The Wolverine 1000 is my next set. The Red Wing Rugged (from J. Crew) has been excellent but I want a non-moc toe. I am dying to know the model number or style name of the Persol glasses. I wonder if they are available online? I take that back: I’d like to get the Garrison: Burton. I just went to Staples and bought a few packs of those VARSITY pens. They’re really cool. Thanks so much for the tip!!! How about a great pair of heavy flannel or tweed pants? Seems most companies assume no one spends enough time out doors to get cold. Freeman’s made a great pair of wool pants last year. I’m sure they’ll have another this fall. The varsity pen is alright kind of sloppy for me though. Maybe I just don’t write fast enough to prevent the massive ink blots. I wish I could comment on the other stuff but I am too poor for those things. Maybe I can substitute a Wal-Mart chambray shirt and some Docs and Old Navy khakis for the more fancy products shown? Oh ya they go those FOTL sweat shirts and pens at Wal-Mart too! Thanks Michael for responding to my question. Also, which color of the Wolverine 1000 boot do you recommend? The red or brown ones? I have a pair of red wings and looking to expand my boot collection. Agreed. I find it hard to put my money where my mouth is. I have been looking for a chambray shirt for a while spending $60 or so at gap for one that is most likely made in a sweat shop seems lame when a good one costs $100 plus but is too expensive. For all the hoodie lovers… this one came up on google and looks awfully close: heather gray w/o the ugly white fleece lining. That UNIS wax pea coat is killing me, so nice. Such an amazing brand IMO. The Varsity and the Parker Jotter are great for bag and desk pens. For a pocket and wallet pen, you can’t do better than the Fisher Space pen family. The bullet pen is great for your pocket, but I stick with the stowaway, which fits right in my wallet. From a design perspective, the bullet and the classic pens look pretty good. Also, they’re made in the USA. Hey, Fisher’s already on the American List! Solid choice with the Varsity pen. Say no to the hoodie go back to the classic crew neck. The one linked above is pretty close, but just doesn’t have the same look or shape. Any other suggestions for cheap ($30-$60ish) hoodies that I can actually buy? Otherwise, I love the look. I’ve been looking at the J. Crew chambray for a year waiting for the price to drop- it’s good to see you all think it’s worth it, might go pick it up.